Cattle Decapitation is an excellent Grind/Metal band. Very much into AR as well. All members are at least Vegetarian and I believe some are Vegan. Location : San Antonio, TX. Hell yeah! some of them are vegan, how great! 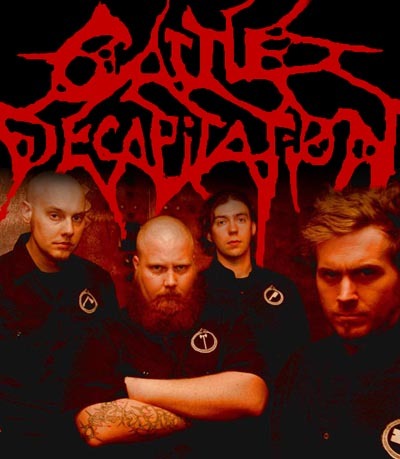 Glen Confront wrote: Cattle Decapitation is an excellent Grind/Metal band. Very much into AR as well. All members are at least Vegetarian and I believe some are Vegan. Ok, I'm not used to foreign abbreviations. In France we say PA : Protection Animale (you'll easily understand what that means). I think it's more near in France to Libération animale, "animal liberation". People of animal protection are not vegan, they don't care about specism. In fact they just take care of pets or wild species. yes you're right. Sorry to don't keep in mind that those who protect animals don't really protect them but their "confort" in reality. But I'm not agree for wild species. No one is interested in them. Just the word Biodiversity and it's not really that they would care about it.